This cake was inspired by the Rasberry Lemon Almond Cake here but has been changed so much it deserved its own recipe page. 100g oil of choice, use a mild flavoured one. Blend well, I do 30 seconds at speed 6 in my thermomix or do 1 minute in your food processor, or mix really well by hand. If you are mixing by hand, sift the flours (everything except for the almond meal) first. If you are using a food processor or thermomix, I find you don’t need to as the machine mixes it for you. Pour into a greased, lined tin. I use a deep sided slice tin. Then I spinkle roughly 1/2 cup of frozen mixed berries evenly over the top. Bake for about 25 minutes in moderate oven (about 170 deg cel) until nice and brown (cooking time will vary depending on your oven). 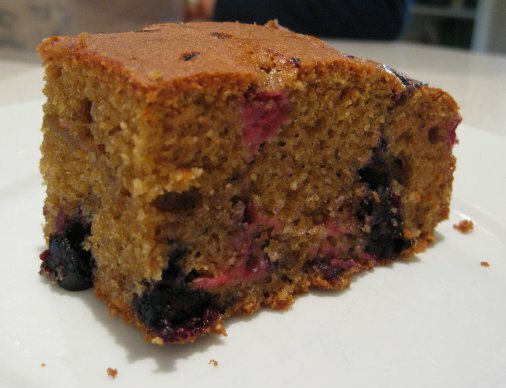 The amaranth flour gives this cake a great texture.